Editor���s Perspective �� From Little Acorns IT transformation is more than a good idea. For the life of the enterprise, it's essential. There���s something fascinating about transformations. Caterpillars into butterflies. Swords into ploughshares. Narcissus, the vain boy of myth, into a white-petaled flower. The transformation of IT may be less poetic, but it���s every bit as fascinating. How does a CIO take something as big, complex, bureaucratic and fixed as an enterprise IT department, and change its essential nature, composition and structure? While transforming IT is difficult, it���s also vital. Vital, in the sense that the life of the enterprise depends on it. The business has new expectations and demands for IT, thanks in large part to the emergence of mobile devices, cloud computing and other technologies. CIOs, in turn, are finding that, to provide the IT services now demanded by the business, they must transform their own internal IT systems, services and even staffs. Nothing less will do. In this issue of Smart Enterprise magazine, we focus our fascination with IT transformation from several perspectives. Our cover story, ���The Transformers,��� takes the 30,000-foot view, showing the mountains, plains and oceans of IT transformation. We swoop in closer with Smart Management, our look at how CIOs are transforming their own skill sets; Smart Practices, a report on transforming IT with energy and sustainability; and Smart Industry, which examines how technology is transforming the auto industry and, soon, the cars we drive. Our two case studies move in even closer, profiling IT transformations at two innovative businesses, ANZ Bank and FedEx. Columns by industry leaders provide more personal perspectives on IT transformation. In his One True Thing column, George Fischer of CA Technologies explains why CIOs are becoming leaders of change. Our Leadership Perspective column by John Michelsen, also of CA Technologies, introduces a powerful tool for IT transformation: simulation. And our Viewpoints column by Hunter Muller of HMG Strategy offers six new rules for IT innovation. 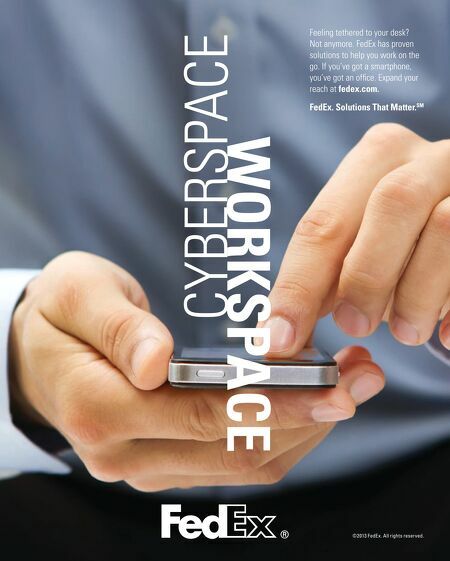 Wherever you are on the IT-transformation journey, I���m confident you���ll find something in this issue of interest, usefulness and transformative power. Insights and Perspectives for the CIO Publisher Mark Hoffman Executive publisher Penni Geller Associate publisher, EDITORIAL DIRECTOR Loni Frazita Associate publisher Lucille Deane Editor in Chief Peter Krass Copy Chief Claire Meirowitz VP/design Director Gene Fedele Creative Director David Nicastro Art Director Giulia Fini-Gulotta Production Adeline Cannone Contributing writers Karen J. Bannan, Leon Erlanger, Tom Farre, Tam Harbert, Alan Joch, Larry Lange, Karyl Scott, Bob Violino Managing Director, Contract Publishing Scott Vaughan Program director Ellen Lalier To subscribe to Smart Enterprise�� magazine, please visit join-see.com/magazine To contact Smart Enterprise, email us at: contactus@smartenterprisemag.com For information about advertising in Smart Enterprise, email us at: advertising@smartenterprisemag.com Copyright �� 2013 CA All rights reserved. All trademarks are the property of their respective companies. Reproduction of material appearing in Smart Enterprise is forbidden without permission. 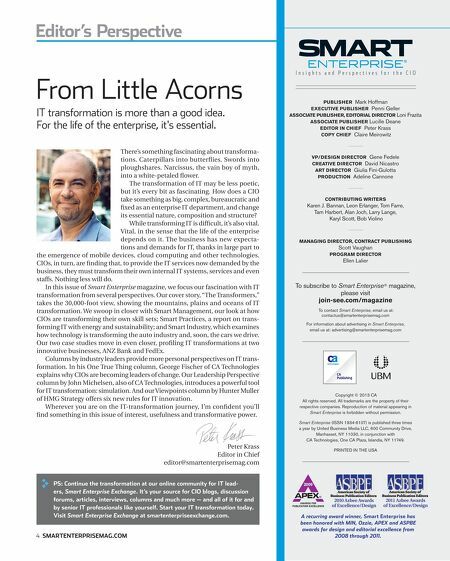 Smart Enterprise (ISSN 1934-6107) is published three times a year by United Business Media LLC, 600 Community Drive, Manhasset, NY 11030, in conjunction with CA Technologies, One CA Plaza, Islandia, NY 11749. Peter Krass Editor in Chief editor@smartenterprisemag.com PS: Continue the transformation at our online community for IT leaders, Smart Enterprise Exchange. It���s your source for CIO blogs, discussion forums, articles, interviews, columns and much more ��� and all of it for and by senior IT professionals like yourself. Start your IT transformation today. Visit Smart Enterprise Exchange at smartenterpriseexchange.com. 4 smartenterprisemag.com PRINTED IN THE USA 2010 Azbee Awards of Excellence/Design 2011 Azbee Awards of Excellence/Design A recurring award winner, Smart Enterprise has been honored with MIN, Ozzie, APEX and ASPBE awards for design and editorial excellence from 2008 through 2011.